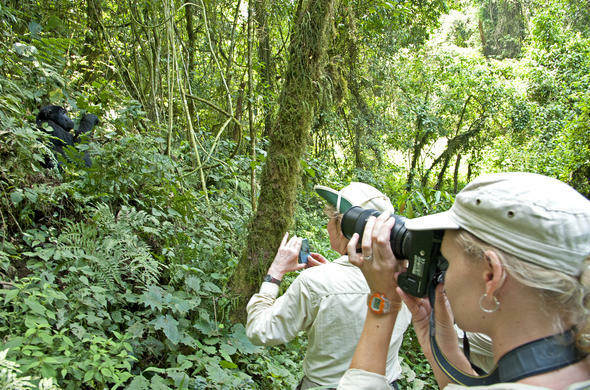 Track down the amazing Mountain Gorilla, go Chimpanzee trekking or bird watching or enjoy leisurely nature walks or game viewing on the Best of Uganda Safari. At the start of your Uganda Safari Tour you arrive at the Entebbe International Airport where you will be met by a representative who will transfer you to Kampala, Mambo Point or similar. On the first day of your Uganda Safari Tour you leave Kampala after breakfast, for a panoramic drive to the Northwest through the famous Luwero Triangle. Stop over at Masindi Hotel for lunch. Proceed to Murchison Falls National Park, the largest protected area in Uganda. Its name is derived from the falls on the Victoria Nile, which divides the park in two sectors. Relax a bit at a situated site on the top of the spectacular falls, where you can see the Nile's perfected beauty, and marvel as it compresses and squeezes itself from over one kilometre wide down through a 7 metre canyon. The 43 metre drop of the falls creates a thunderous roar and a beautiful rainbow in a plume of spray - the best thing to ever happen to the Nile. Dinner and overnight at Paraa Safari Lodge with a unique view on the Nile. After an early breakfast on your Uganda Safari Tour, go to the northern part for a game drive where you can view and take photographs of Elephant, Buffalo, Waterbuck, Hippo, Giraffe, Uganda Kob, Lion, Leopard and a variety of birds. After lunch, proceed for a two-hour cruise to the bottom of the mighty Murchison Falls from where plenty of raging water escapes from the narrow gorge forming a great thunder. This is an opportunity to see amazing Hippo and Crocodile along the riverbanks. Return to the lodge for dinner and over night. On day 4 of your Uganda Safari Tour enjoy a breakfast drive from Murchison Falls Southwest via the Albertine Escarpment of the Western Rift Valley. Drive through Hoima and reach the colourful and pretty town of Fort Portal, the capital of the Tooro Kingdom, in the shadow of the fabled 'Mountains of the Moon,' the Rwenzori. Start day 5 of your Uganda Safari Tour with a cup of coffee, then set off for a game drive along Kasenyi track and Queens Mile in the park. Expect to see Lion, Elephant, Buffalo, warthog and lots many animals and birds. Get back to the lodge for breakfast. After lunch, enjoy a 2 hour launch trip on Kazinga Channel for amazing bird life and a variety of wild animals. Evening drive to the Crater Lakes region is splendid. Enjoy dinner and overnight at Mweya Safari Lodge. On day 6 of your Uganda Safari Tour receive a packed breakfast and lunch then drive to Kyambura Gorge for a forest walk in search of Chimpanzees and other primates. This gorge is 16km long on the rift Valley and 10 metres deep. The rangers will provide you with a walking stick for this spectacular trekking. After the primate walk, drive to the Bwindi Impenetrable National Park through Maramagambo and Ishasha sections of the Park. Dinner and overnight at Buhuma Homestead. After breakfast, leave for the Ishasha sector of the park for a game drive in search of the tree climbing lions. Packed lunch. After the game drive proceed to Bwindi for dinner and overnight. Enjoy an early breakfast and briefing from the guides then set off for the Mountain Gorilla tracking inside the Bwindi forest. You need to carry drinking water, rain jacket and jungle boots while the rangers provide you with walking sticks. Gorilla tracking is one of the unique activities you will enjoy. Photograph and observe these amazing creatures. After tracking, come back to the Homestead for lunch before making a scenic journey to Kabale through the beautiful terrain of the rolling hills with terraced landscape. Arrive at an area referred as the 'Switzerland of Africa'. Enjoy dinner and overnight at Arcadia Cottages, with the most incredible view of the Lake Bunyonyi. After an early breakfast on the second last day of your Uganda Safari Tour, enjoy a two hour boat ride on Lake Bunyonyi to various islands inside the lake for bird viewing, sight seeing and discovering the sites of the Bakiga culture. Drive to Kampala. Lunch en route to Mbarara at Lake View Regency Hotel. A stopover is made at the Equator for photography. Have dinner and overnight at Mambo Point or Africana Hotel in Kampala. Your day starts with a two hour boat ride on Lake Bunyonyi around the various islands on the lake for bird viewing, sight seeing and discovering the sites of the Bakiga culture. Return to Kampala with lunch enroute. Along the way you will see Ankole long horned cattle, banana plantations, drum makers, papyrus swamps ,roadside barbecue and friendly people to bargain with, arriving on time for your onward travel arrangements. Chimpanzees are very social. They travel, feed and rest together. When resting they may play with each other or groom their partners, which is one of their favourite activities.